Since I missed the last one, I had time to really ponder this weekend's herb blogging. By the way, I really like Kalyn's new logo for Weekend Herb Blogging - very nice. Anyway, I originally had another herb in mind ... lily bulbs. But a number of things perturbed me about this herb. Chief among them was my grandfather's warning not to consume too much of it. I wanted to be super careful to discover any adverse effects (to me at any rate) if I used it. Also, I'd bought fresh lily bulks and there are very few recipes for these. 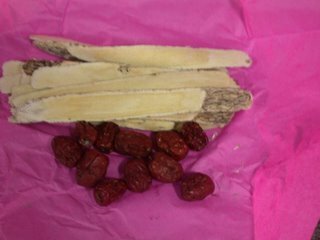 Most of the Chinese medicinal recipes I know utilises dried lily bulbs. So while I was pondering this, I came across some lotus roots. I'd written about the lotus plant, specifically the lotus seed, a couple of weeks ago. So I thought it may be rather fitting that I continued in Ah Lian fashion and posted about the root now. I've always liked lotus roots. They have a crunchy texture with a subtle, slightly sweet and delicate taste that lends itself well to soups. And I adore soups. I also inhale lotus root pickles which are served as amuse bouche in Chinese restaurants - they are just too too addictive. 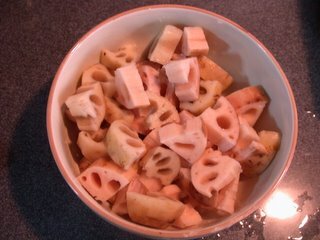 So the lotus root looked like it would be the star of this week's Weekend Herb Blog. 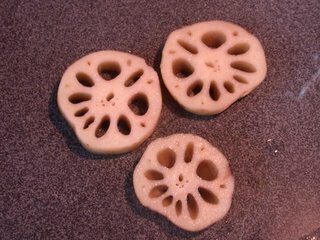 The lotus root is a fairly odd-looking specimen. Cylindrical with segments that makes it look plump, rounded and wasp-waisted, it is a fairly robust root that resembles a mutant sausage. I remember an argument with a cousin as a child where we decided to battle it out a la Star Wars with individual "lightsabers" aka lotus roots. I think we both had a bit of concussion for a few days after that. The parts around the joints are darker brown in colour, contrasting with the paler beige of the rest of the root. 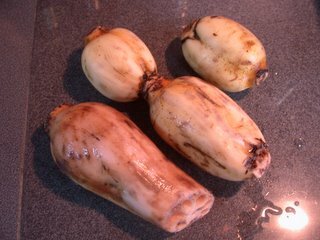 If you buy lotus roots fresh from the markets, it is usually mud encrusted. But nowadays you can buy freshly scrubbed and pretty looking ones from the supermarkets. Try to buy lotus roots without any fine roots protruding out as that means it's pretty old. Young lotus roots are crisper and juicier so do get lotus roots that are fairly unblemished. You can eat these raw or pickled. 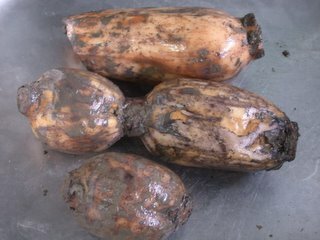 The older the lotus root, the more powdery the taste, thus they are best used for soups. Lotus roots nourish the blood, removes blood stasis and improves blood circulation. Which is why lots of Chinese mothers brew pork ribs and lotus root soups for their children to strengthen their bodies. I liked the taste of this soup so much I finagled the recipe from the cleaning lady in my office and it's been a firm favourite for years. While this aquatic rhizome looks vaguely rude whole, they are flirtatiously pretty once you cut it up into rings crosswise. With whimsical hollows (the air valves actually) inside, they resemble lacy pinwheels when sliced into thin rings. My grandfather once cut lotus roots into stencils which we dipped into paint and created fabulous collages. He also taught me to dye thin rings of lotus roots and dry them so I could make jewelry. I refused to give those up even when I went home, driving my grandmother completely barmy. The lotus has been around since time inmemorial which is why it features so much in the ancient art of China, Egypt and India. 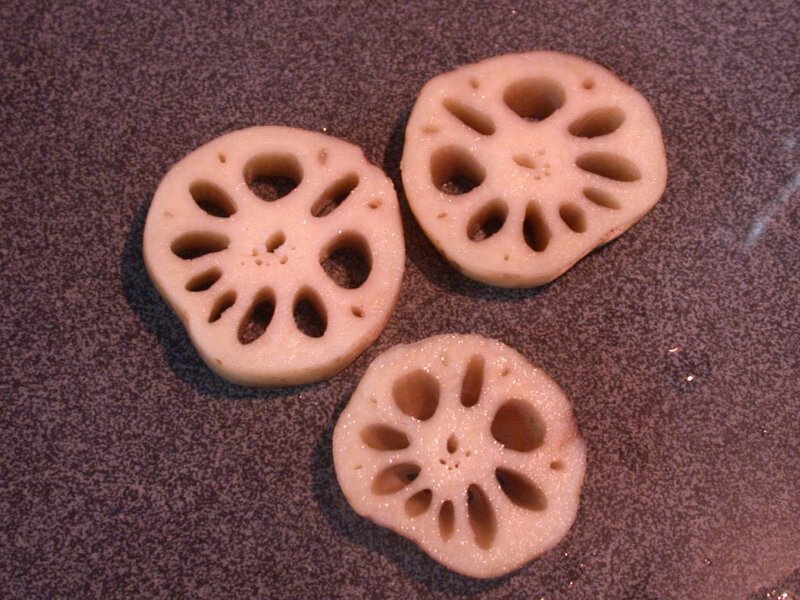 It also explains why the lotus root appears in many Asian cuisine from salads in Thailand to soups in China and pickles in Japan. In China, the lotus root is usually paired with fatty meats because of its ability to absorb and negate excessive richness. Hence the pork ribs and lotus roots soup. Other additional benefits includes the lotus root's ability to stimulate the appetite, and if you drink a tea brewed from this root over a prolonged period, it will help dissolve and eliminate mucus and lung congestion. Overall, the lotus root is considered a cool herb in Chinese medicine with the ability to clear heat so it's great in tropical Singapore. Consuming the lotus root also helps your liver function effectively. It is highly lauded for strengthening the heart, stomach and spleen. Apparently, drinking uncooked lotus juice can stop internal bleeding and clear “heat” , while the cooked lotus root can treat anaemia from heavy menstruation and promote greater energy. I managed to find the following nutritional facts in a cup of lotus roots which I thought dieters might find interesting (since I made cracks about dieting in previous posts, this is my compensation). I did not make pork rib and lotus roots soup as I wanted to investigate more unusual ways of using it. 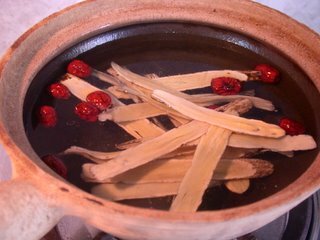 So when I came across a Chinese medicinal soup featuring fish, lotus roots, red dates and astralagus root aka huang qi, it intrigued me enough to try it. This herb looks like a piece of bark but it really is a root. Huang qi helps enhance qi or internal energy, helps eliminate excess water in the body and improves your immune system. It is extremely useful if you have been feeling short of breath or have hypertension. However, asthma patients (like me) should avoid this herb or take it in very limited doses and applications. Anyway, huang qi is especially good for men as it strengthens the yang qi as well as the walls of your blood vessels. With its ability to heal buises and improve circulation, it is actually quite effective for women suffering from constipation as it aids digestion. This herb also strengthens the immune system and the heart, lowers the blood pressure and protects the liver. Huang qi tastes slightly sweet and is considered a warm herb. When choosing huang qi, choose thicker thicker slices that are not hollow or discoloured in the middle. There are two types of red dates - the jixin (chicken-heart in Chinese which made me think of Chicken Run and Chicken Little) and the putong (ordinary) red dates. The jixin red date has better medicinal properties and can be obtained from Chinese medical halls. Red dates are sweet and considered as warm in nature. Red dates helps the spleen and stomach work better and is used to help eliminate sallow complexion and emaciation as well as manage poor menstrual flow. Red dates regulate your qi and stimulates bodily fluid secretion. They also promote blood cell formation, calm the nerves and women love them as they retard the process of aging while moistening the skin. That is why red dates are used so often in Chinese desserts. These are the herbs used in the recipe for Carp Soup with Lotus Root and Red Dates. Unfortunately, I can't seem to find carp at the markets here so I used a sea bass I already had on hand. Carp is a better option for this dish as it is supposed to be able to reduce wrinkles but sea bass is an adequate substitute. 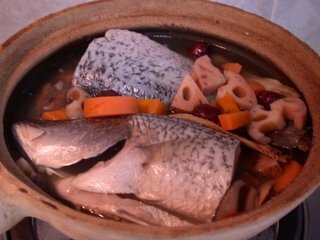 Thus, I re-dub this dish Sea Bass Soup with Lotus Root and Red Dates. As you can probably guess by now, this soup is one for the girls. 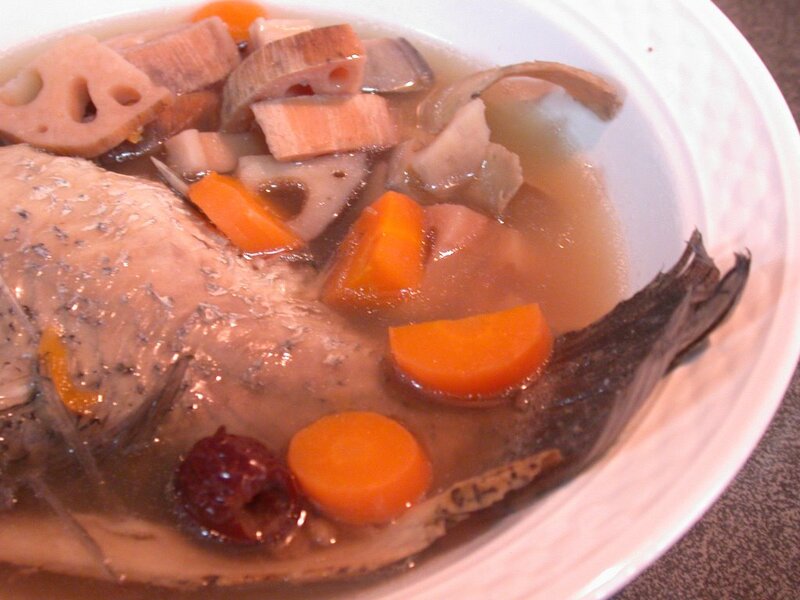 This Chinese herbal dish is an anti-wrinkle soup and claims to cure acne as well. It also helps clear sallow complexion and dizziness caused by anaemia. It stands to reason that women are advised to have this soup on a regular basis. The soup was a surprise. I am used to Chinese herbal medicine being bitter but this dish was very sweet. 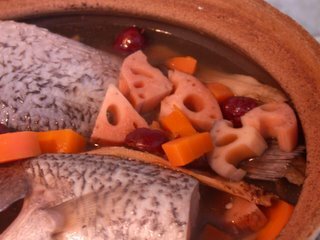 The red dates, carrots as well as the natural sweetness of the sea bass made this dish very sweet to the tastebuds indeed. The wine nicely countered this with its smokey, mulled flavour and the huang qi gave it enough of a hint of herbs to make it interesting. I found myself enjoying this dish immensely and I felt really good after eating it. 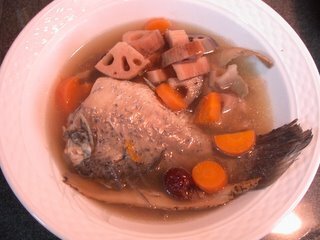 The lotus root and carrots were soft enough not to create an unpleasant contrast to the tender fish yet had enough crunch to give it the necessary complexity of textures. I really liked it and was glad I tried this dish although I normally scorn "beautifying" Chinese herbal concotions. So, I will give this a 9.75/10 and a 9/10 for taste. I felt so virtuous after this meal I decided to continue this health kick by having a tofu dessert. I first came across these little cartons in the supermarket. 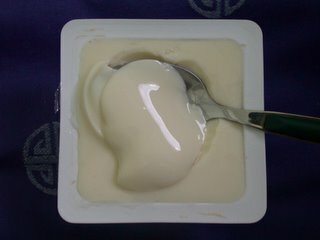 Essentially they are tau huay, a very popular beancurd dessert in Singapore. What is unusual is that it is almond flavoured! I drool over almonds and the combination of silky beancurd with milk almond was just too appealing for this no-willed glutton. I am now mildly addicted to this inexpensive but highly delicious dessert. this one sound really good. i have always boil lotus root with pork ribs. how boring is that! i'm gonna try yours out! I know. I love my pork rib and lotus root soup but it's nice to try something new, isn't it? This one is quite a refreshing change! Good luck! Very fascinating. I'm sorry it took me so long to get back here and read it. You always do such a good job of explaining things that may not be obvious to people who don't know much about Asia. Thanks so much Melissa & Kalyn! It means a lot coming from you both since your blogs are so amazing. I second Melissa's comment: "Amazing post!" Very enlightening. The tofu I've had hasn't been great. Hasn't made me go running back for more but I'd like to taste your dessert, after your description. Thanks, Paz! You're always so encouraging! Actually, there are many types of tofu. You probably have been buying the firmer tofu which is usually pale golden outside because it has been deep fried. The tofu used in the dessert is the softest of all the tofus - even softer than the silken tofy usually used in savoury dishes. You should probably be able to find softer tofus at your local Asian market. Just tell them you want silken tofu.